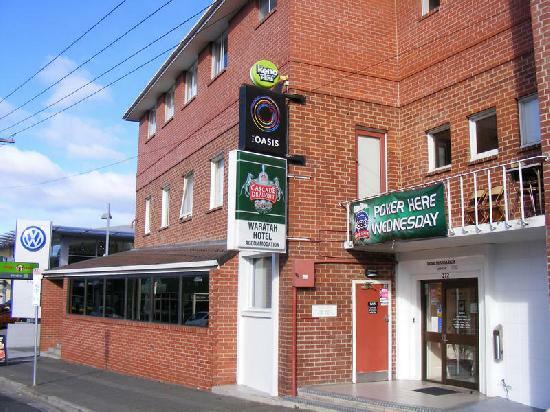 Located in the heart of Hobart, Hobart Mid City Hotel provides motel/hotel acccomodation with all of Hobart's attractions easily accessible. 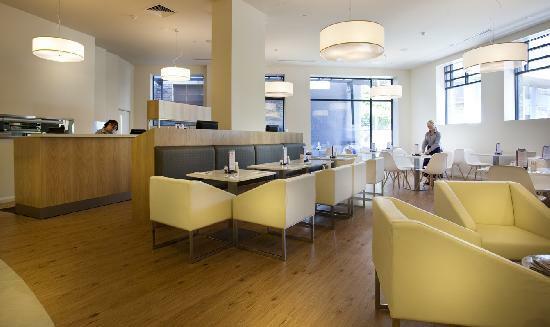 Situated in the heart of the Hobart CBD the accommodation at the Hobart Midcity Hotel comes complete with complimentary off street car parking and many other facilities as well. 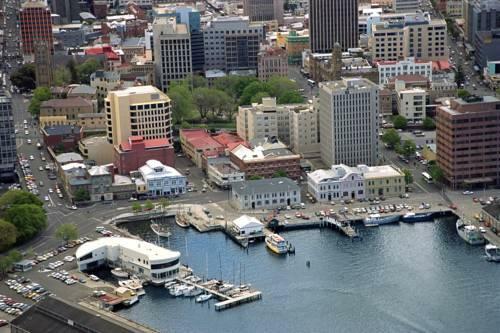 When staying at the Hobart Midcity Hotel guests can stroll around Hobart CBD and the waterfront precinct, visit famous Salamanca Market, and check out the views of Hobart city from Mt Wellington. 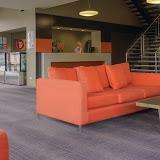 Is also features numerous guests facilities in order for you to feel right at home during your stay in the Hobart CBD. 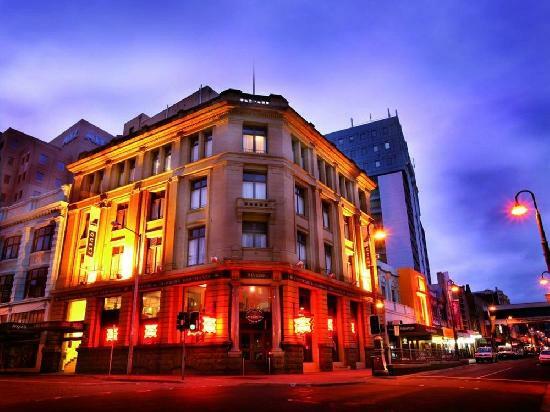 Hotel accommodation in Hobart CBD that is economical and well located with only a 5 minute walk to the heart of the city and Salamanca Market. Many of these hotel rooms have fantastic views of either the city centre and river or Mt Wellington. Stay in central Hobart in affordable accommodation with complimentary car parking as you explore all the sights and attractions of Hobart.Leisure Inn Hobart Macquarie offers sensibly priced, contemporary accommodation at its best and is the perfect choice for value conscious travellers on a strict budget through to executives, families and groups. All types of travellers can take advantage of the discount accommodation at the Hotel Collins, as well as the range of modern amenities including lounge bar, business centre, conference centre, direct internet access, disabled facilities, faxing facilities, guest laundry, lift, restaurant, room service, tour desk, 24 hour reception, babysitting service and daily housekeeping. Further facilities include business centre with faxing facilities, luggage storage, lift/elevator, daily housekeeping, conciergedry cleaning service, wheelchair accessible, laundry service, car parking (fees apply), in-house movies, porter/bell service, tour desk/bookings, a restaurant/bar, baby sitting service and 24-hour room service. 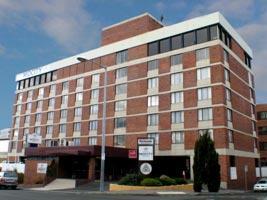 Whether your travel to Hobart is for business or pleasure, Hotel Collins will make your trip even more pleasurable. Quest Savoy is a truly unrivalled property located in the heart of all that Hobart has to offer. Quest Savoy Apartments Accommodation is superbly located in the heart of Hobart CBD, shopping and business precinct, adjacent to the Hobart shopping mall and only metres to the historic and vibrant waterfront and Salamanca Place, abounding with restaurants, cafes, and galleries and even closer to our increasingly cosmopolitan CBD. One of the best things about staying at the Quest Savoy Apartments in the Hobart CBD is that it is perfect place to stay for day trips to Port Arthur, Richmond, The Huon Valley, Tahune Airwalk, wineries & Russell Falls. 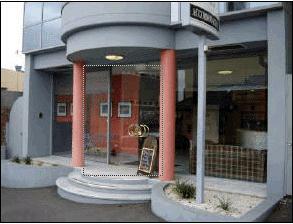 If you are shoosing to stay in the Hobart CBD you can take advantage of the discount accommodation at the The Old Woolstore Apartment Hotel, as well as the range of modern amenities including lounge bar, business centre, child minding, conference centre, direct internet access, disabled facilities, faxing facilities, free car parking, guest laundry, gym, lift, massage, restaurant, room service, secretarial services, tour desk, garden, airport shuttle, security, 24 hour reception, baby cots available, babysitting service and daily housekeeping. Built behind the National Trust listed façade of one of Hobart's best known old buildings, the Robert's Limited woolstore, The Old Woolstore Apartment Hotel is a masterful example of how historic values can be preserved in the context of a truly contemporary development. Committed to offering genuine, friendly and professional service to guests the Old Woolstore Apartment Hotel staff are encouraged to be themselves and make every effort to help make your time in Hobart as relaxing and enjoyable as possible. All types of travellers can take advantage of the discount accommodation at the Zero Davey Boutique Apartments Hotel, as well as the range of modern amenities including direct internet access, disabled facilities, faxing facilities, guest laundry, gym & fitness equipment, lift, sauna, secretarial services, airport shuttle, baby cots available and daily housekeeping. Guest facilities and services that includes off street car parking, luggage storage, friendly staff that can assist with local attractions. 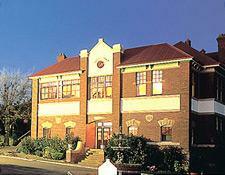 Zero Davey Boutique Apartments Hotel also caters for corporate business travellers with faxing/copying facilities. 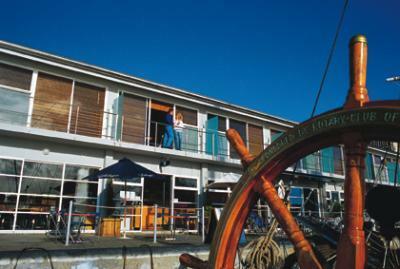 Quest Trinity House is regarded as one of Tasmania's most spacious and unique serviced apartment accommodation. Quest Trinity House offers 3.5 star studios, 1, 2 & 4 bedroom self contained apartments accommodation ideally located in Hobart on the fringe of Hobart's historic Glebe - only a 5 minute stroll from the CBD, Hobart's Waterfront, Salamanca Place, North Hobart restaurant precinct and all major sporting venues including Hobart's Aquatic Centre. All types of travellers including business guests, families and holiday makers can take advantage of the discount accommodation that is provided by the Harringtons 102. Conveniently located in the Hobart city centre the Harringtons 102 also has a wide range of modern amenities in order for you to feel comfortable throughout your stay. Separate laundry and ironing facilities are also available at the property. Harrington's 102, which is a smoke free hotel, does not provide parking access, but has safe onstreet parking. Continental breakfast is included FREE of charge. Harringtons 102 is the ideal and inexpensive hotel from which you can base your stay to visit the delights of southern Tasmania. The Quest Waterfront Apartments is close to everything that Hobart has to offer and features numerous guests facilities including business centre, child minding, direct internet access, disabled facilities, faxing facilities, guest laundry, lift, secretarial services, tour desk, airport shuttle, security, babysitting service and daily housekeeping. It is bursting with Restaurants and cosy little bars such as the Bird Cage Bar with nightly live entertainment, and the Sports Bar with its huge screen to keep up to date with the latest sporting events. Make the most of our fabulous location and sample some of our Fresh Tasmanian Produce available at Salamanca Markets every Saturday. Quest Waterfront is the ideal for the corporate guest or as a base from which to explore Hobart and Southern Tasmania on your next romantic getaway or family holiday. 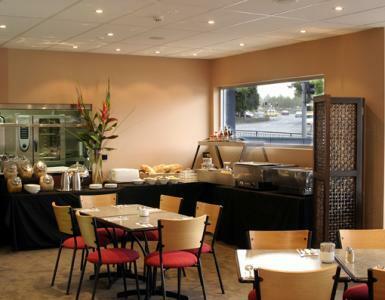 All types of travellers can take advantage of the discount accommodation at the Rydges Hobart, as well as the range of modern amenities including lounge bar, business centre, conference centre, free car parking, guest laundry, restaurant, room service, outdoor swimming pool, tour desk, bbq and 24 hour reception. Accomodation is non smoking, however suites with external access can be allocated for guests wishing to smoke (please specify requiirement when booking). Offering a lush garden setting, and genuine, enthusiastic service only minutes from the Hobart CBD, the Rydges Hobart provides the perfect base for exploring this city's spectacular sights. Mt Wellington, the Huon Valley, and Constitution Dock are just a few of the many attractions on offer in Southern Tasmania. The Somerset on the Pier is close to everything that Hobart has to offer and features numerous guests facilities including lounge bar, business centre, direct internet access, faxing facilities, free car parking, guest laundry, lift, massage, room service, airport shuttle, 24 hour reception, baby cots available and daily housekeeping. Featuring spacious loft style apartments with contemporary decor, Somerset on the Pier offers a welcome alternative to a hotel and is ideal corporate housing for the executive and international family for a short holiday or extended stay. When staying at Somerset on the Pier our staff will use their local knowledge to help you quickly settle into the city and integrate with the local culture. Our residences provide environments that are a comfortable place to escape and immerse yourself into the city. 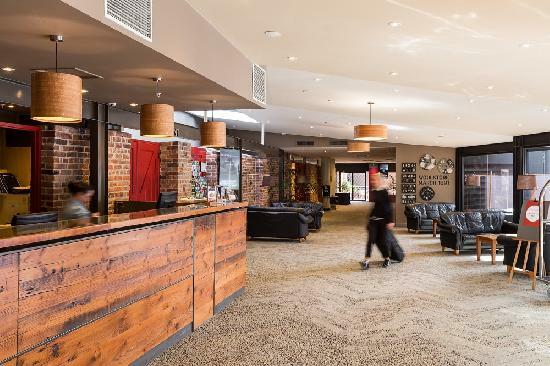 All types of travellers can take advantage of the discount accommodation at the The Waratah Hotel, as well as the range of modern amenities including lounge bar, direct internet access, free car parking, guest laundry, restaurant and daily housekeeping. Hobart's only 24-hour bottle shop operates at the rear of the hotel. Further guest facilities and services include daily housekeeping, tours desk, bar / lounge, guest laundry, dry cleaning / laundry service and FREE onsite car parking. But the best part of staying at The Waratah Hotel is the free, hot cooked breakfast each morning.